Ok I know. 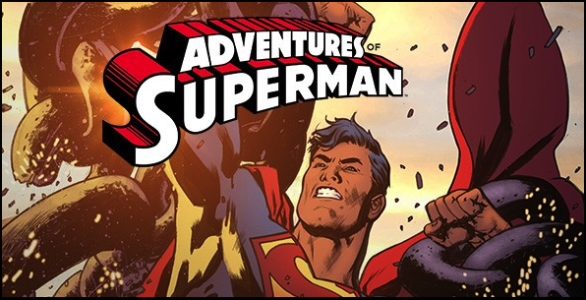 DC’s weekly digital instalment, Adventures of Superman, isn’t exactly a webcomic. But technically it’s digital first and it’s a comic so I’ll allow it. Plus it’s the 75th anniversary of the quintessential superhero, and I haven’t had a chance to give this title much love. Hello and welcome to Webcomic Digital Wednesday! Each week I take a look at a webcomic digital comic and let you know what I think about it. This week I’m taking a look at one of DC’s newest line ups of weekly digital comics, the brilliant Adventures of Superman, which incorporates a wide swathe of talent from across the industry. I’ll admit I have never been a huge Superman fan until recently. With Zack Snyder’s Man of Steel, the 75th anniversary of Superman, and the recent effort on DC’s part to promote the man, he’s seen a big resurgence. Adventures of Superman is the next step in this promotion, a series of one-shots crafted by industry talent, big and small, each telling a different story of the man. And it is brilliant. There isn’t any pressure to fit in with the rest of the universe – no problems with continuity or New 52 garbage. These are just straight Superman tales, each only limited by the creators imagination, as they each try to capture a piece of his day to day life. There is just so much heart to these stories, and they are often told in inventive and fun ways. From standard, “beat the bad guy” stories, to children pretending to play as Superman and Brainiac, each tale feels unique and so far it hasn’t stumbled. If you ever needed an excuse to get into Superman stories, look no further. So far my favourite is the second issue, written and drawn by Jeff Lemire. But don’t take my word for it, check out the series here , or on any device with the Comixology/DC app. For a dollar a pop, it’s a steal.